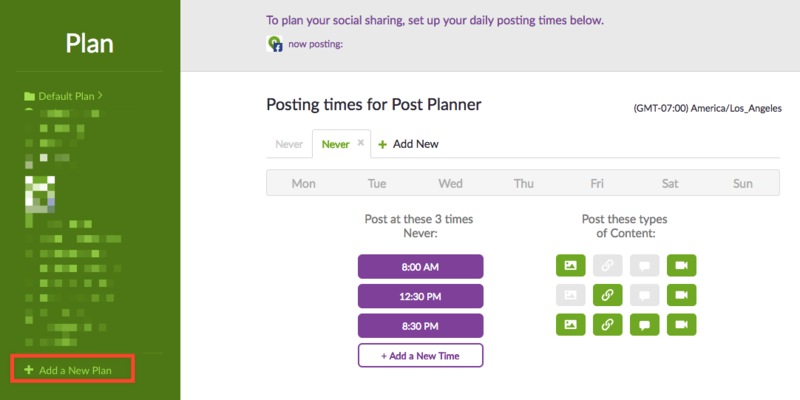 Do you need to pause or delete all of the content in your Post Planner app? Below are the steps to take if and when you want this applied in either bulk or one post at a time. Choose the social profile to remove or delete posts from. To the left of "Planned/ Posted" hover over and check the box. Click the pencil to edit posts in bulk. Now choose "Delete All." All posts for that Page, Group or Profile will be removed. You can also pause any content currently ready to post. Go to PLAN where you'll pause your time slots. This will keep your content in the POST section, but no time will be applied. Choose the plan for the social network you want to pause (if you don't have a custom plan, you'll need to do this for the Default plan). Hover over and deselect each day. This removes and date/time associated with that custom plan. IMPORTANT: if you only use the Default plan, pausing it will pause content for all social profiles. To avoid this, create a new custom plan by clicking the + icon at the bottom of Default plan. Choose the page / profile you'd like to create a plan for and then follow the instructions above to remove those days and times. Once you're ready to start posting again, come back into your default plan and highlight those days again. Once green, you know they're active.